Hair care line based on Dead Sea Minerals & Natural Oils used by traditional tribal cultures for thousands of years to treat, nourish and beautify. Enriched with proprietary Natural Anti-Aging technology “NAA”. Style Aromatherapy brings a part of this wonderful and secret world and enables you to taste few from this marvelous big mystery. Innovative treatment hair care line based on pure Keratin & patent technology KeravisTM , formulated specially to treat the Hair after straightening and daily blow drying. This combination of plant origin protein increase the hair strength and avoid it from become fragile and brittle. The delicate unique formula is free from Sodium Chloride salt, Paraben, SLS/SLES and enriched with Argan Oil, Natural Oils to insure a long lasting protection of hair straitening results and improve dramatically the hair health and look. Naturally produced in the hair follicle and scalp. 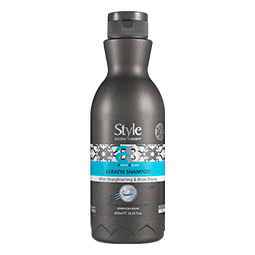 Built from 18 amino acids, essential to hair nourishing and strengthening. Decreases with age, chemical treatments and environmental damages. Great for dry, mature, aging skin, and dry skin spots. Adding Keratin to a chemical treated hair is an essential step to rejuvenate hair look and texture and to repair damaged hair. Increases the strength of virgin and damaged hair. Able to triple the strength of damaged hair compared to a control conditioner. Strengthens hair to resist combing damage. Demonstrates strengthening and anti-breakage properties when compared to Panthenol. Suitable for use in all hair care applications. Proven efficacy from rinse-off systems. Visible, consumer-perceivable improvement in hair strength. How Does Keravis Strengthen Hair? Keravis is a functionalised hydrolysed vegetable protein with reactive silanol that utilises patented copolymer technology. The unique chemical composition of Keravis enables it to act on all three of the identified hair breakage mechanisms. 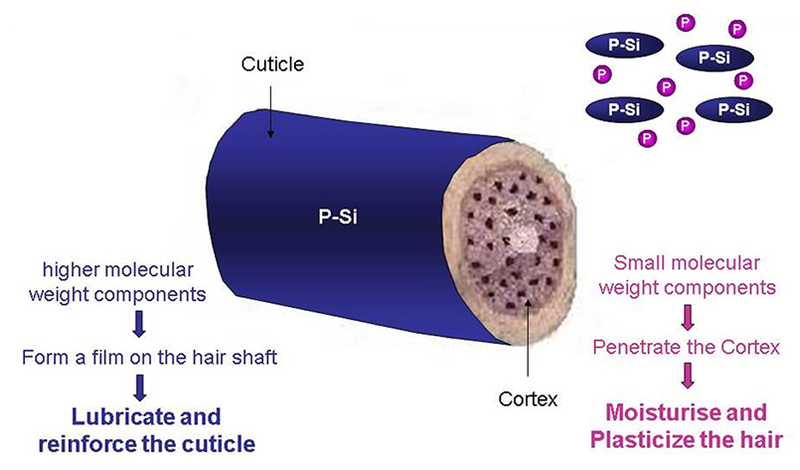 Cuticle penetration builds strength from within to increase resistance to tensile forces and withstand bending stresses. Film formation reinforces, lubricates and protects the hair surface from friction damage, preventing cuticle abrasion and loss. 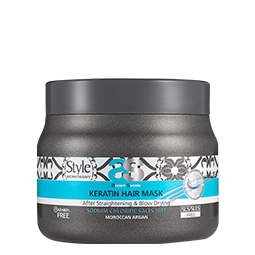 Keravis is substantive to the hair when delivered from rinse-off systems and can also be used in leave-on formulations. Argan oil produced from the nuts of the Argan tree growing in Morocco’s Atlas Mountains, has unique restorative and therapeutic properties that have led Moroccans to call it the “Tree of Life”. Containing the strongest anti-oxidant properties found in nature, and lineolic acid (Omega 6), Omega 9, Vitamin E and Squalene, Moroccan women have for generations, used the oil to strengthen and care for hair, skin and nails. Famous worldwide for its remarkable anti-aging properties, Moroccan Argan oil is also a natural sun filter with remarkable properties that protect hair and skin cells and keep them replenished and moisturized. The king of Natural oils, produced from a plant that possesses natural anti-aging properties. Borage is not a new discovery. Before the anti-aging products and research existed, people were using it in ancient Rome to enhance natural beauty. It was even used by world class ancient beauties like Cleopatra and Nefertiti. After research, it has been found that the borage seed has several compositions within it that are very identical to the human skin cell structure and also acids that are beneficial for the skin, scalp and hair. Borage oil is a regenerating oil. Borage oil is the richest natural sources of gamma linoleic acid (GLA 24%), an omega-6 fatty acid. Borage oil contributes to the healthy function of cellular membranes by maintaining the stability and fluidity of dermal cells and preserving the skin’s natural water-loss barrier. Borage Oil is an essential fatty acid that diminishes in skin naturally as they age, resulting in a loss of firmness, hydration and elasticity. Borage Oil is a very powerful anti aging agent and helps to speed up the skin repair process and restores the skin’s youthfulness, softness and elasticity.